2 yellow ripe bananas( those big ones used for cooking). Peel banana and cut in half (length wise), then cut each piece into 4 pieces(depends how long and thick the banana is). Take white flour in a bowl, add sugar, baking powder. ghee and cardamom powder,a dd little water to make a thick paste, mix well so that no lumps remaining. 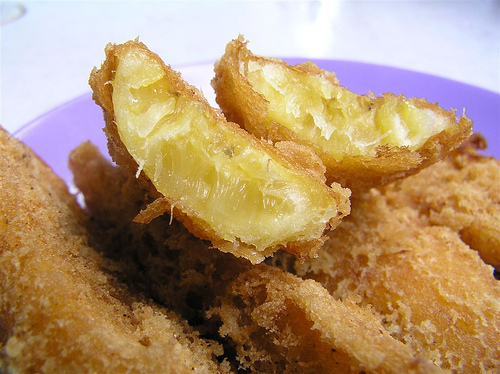 Coat each piece of banana in this paste and deep fry in hot oil on medium heat, until golden brown.